In a medium saucepan, combine water and apple juice concentrate, and heat slowly, but do not allow to boil. Remove a small portion of the hot liquid and mix it with the cornstarch in a separate bowl. When smooth, add cornstarch mixture to saucepan and bring mixture to a simmer, stirring constantly. When liquid becomes clear, gently stir in blueberries, blackberries, and strawberries. Remove at once from heat and transfer to a large bowl. Chill in refrigerator until cold. 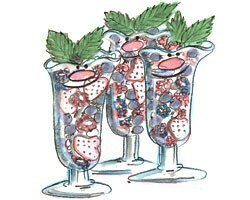 Carefully stir in raspberries, then spoon compote into sherbet glasses and garnish with mint leaves.